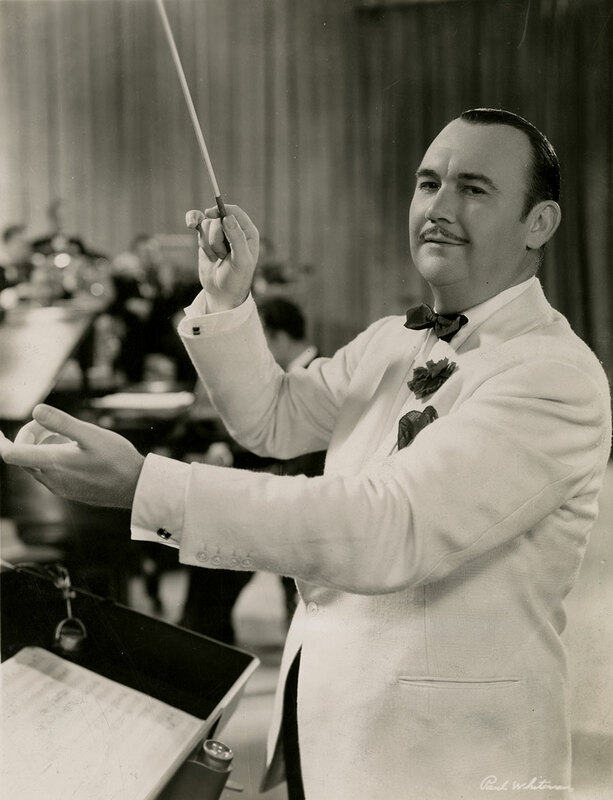 Born in Denver in 1890, Paul Whiteman was raised in serious music by his father Wilberforce, director of music for the Denver Public Schools and the first teacher to organize an orchestra in an American school. As a student at East High School, Paul learned viola and started in 1916 with the Denver Symphony Orchestra as first chair. After time with the San Francisco Symphony, he started the Paul Whiteman Orchestra in 1918, and by late 1920, the nine-piece ensemble had relocated in New York City and played the Palais Royal for the next four years—the earliest dance band to invade the East successfully from the West. On February 12, 1924, he staged a concert blending symphonic music and jazz at Aeolian Hall, at that time New York’s sanctuary of classical music. Special compositions were written for this concert, and George Gershwin, playing piano, introduced “Rhapsody in Blue,” which would become Whiteman’s theme song and go on to immortality. By the end of the Roaring Twenties, Whiteman was the biggest name in the music business, with press notices referring to him as the “King of Jazz.” He had the largest and best-paid dance orchestra in the country, an imposing all-star ensemble of up to 35 musicians—the first to play arrangements; the first to use full brass and reed sections; the first to tour Europe. Sidemen included many greats and future bandleaders—Bix Beiderbecke, Tommy and Jimmy Dorsey, Johnny Mercer and Jack Teagarden. In late 1926, Whiteman signed the Rhythm Boys to sing for his band; Bing Crosby’s prominence in the trio helped launch his career, and his first three No. 1 records were as Whiteman’s vocalist. Whiteman had 28 No. 1 records during the 1920s and 32 during his career. His version of “Ol’ Man River” with Paul Robeson on vocals would be inducted into the Grammy Hall of Fame in 2006. Whiteman did not jump into radio as quickly as some of his fellow bandleaders, but by 1928 he was on the air. He and the band made The King of Jazz for Universal Pictures in 1930, one of the first feature-length movies filmed entirely in Technicolor. In the early 1930s the Whiteman band became more of a show unit than a dance orchestra. The size of the band later decreased, but as late as 1938, his personnel roster included 27 musicians and a vocalist. When radio programming shifted to disc jockeys, Whiteman briefly spun platters on ABC. And after television came on to the market, he made a number of special TV appearances and was Jackie Gleason’s summer replacement in 1955. In the early 1960s he promoted sports car racing in Florida and California. Whiteman died in a Pennsylvania hospital in 1967 at the age of 77.